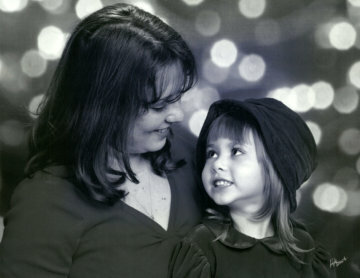 Wendi Machelle Reed (nee: Bly) of Saint Charles, MO, passed away Saturday, February 9, 2019 at the age of 44. Beloved wife of Kascar Reed; cherished daughter of Carol and Thomas Moran, Jr.; devoted mother of Desirae Machelle Hoerner, KyLale Matthew Reed, and Kasey Ryan Reed; loving grandmother of Marley Paige Smith; treasured granddaughter of Darlene "Nana" Sutherland and the late Gene Sutherland; and dear sister of Thomas (Becky) Moran, Johnny (Londa) Moran, Angela (the late Curtis) Long, and Amy (Donny) Eckrich. Wendi was also preceded in death by her brothers Russell Vela and Scott "Scooter" Vela; nephew Casey Vela; and mother-in-law Frieda Reed. Wendi is also survived by many loving nieces and nephews. Wendi loved the arts. She enjoyed creating with her hands, such as crocheting, knitting, and sewing, and being an amateur photographer. She also enjoyed nature, being outside to watch butterflies or gardening, and she loved to cook. Wendi will be remembered for her energetic, loving personality and her vivacious laugh. Her deep love for her family will never be forgotten. She will be greatly missed by all who knew and loved her in return. Memorial contributions may be made in Wendi's honor to The Butterfly House. My deepest sympathy to your family of the loss of our beautiful Wendi.May she eternally rest in the hands of our Lord. So sorry for your loss! She was beautiful in side and out! She always me me laugh and always made me smile! Will be praying for you all! Wendy was beautiful inside and out! She also put a smile on my face but most of all made me laugh! She will be missed by many but not forgotten! Praying for you all! The picture Lady is what my daughter called her. You were a gem. Footprints on my children’s heart and mine forever. Oh windi😭😭idk how this could even be. I would text you throuth the years to check in and chat to see how you and your beautiful family was doing. I remeber going to uncle toms and aunt carols to visit when you came down and i would follow you everywhere you never got outta my sight. And when you had ky she was the most beautiful baby ever i alwaysed wanted to hold him and ellie. We are gunna miss you so much. I love you and you was always one of my favorites my heart is broken and still wounderin how it could just be so true. But god knows and i know that you and god and all our loved ones are gunna make sure our family will be just fine i love you so much wendi reed fly high sweet momma. RIP Wendi you were a great mother and wife. You will be missed . I am still in shock. You were always trying to overcome your affliction. My dear cousin, you watched me grow up and even were embarrassed by me at Westridge Mall. Those are memories that I will forever cherish, I wish we had more time together but I’m truly thankful for the times that we did share together. I love you always!! My deepest condolences to you and your family. May Wendi rest in eternal peace. Prayers for strength and understanding for you all. RIP my dear cousin. I have some great memories exploring kachina village for the short time we had! My thoughts and prays for your beautiful family!!! My deepest condolences to you and your family. May Wendi rest in peace as she walks with angels. I am sure she will be missed by all. My condolences to Wendi’s family. I work with her sister Amy and my heart and prayers of support are being sent your way. You will be missed, my friend. You were a bright light!! Our condolences to the family of Wendi Reed. May her soul Rest In Peace and her family know the comfort of Gods love. Carol, I’m so very sorry for your loss. May you feel the good Lord with you during this time. Fly High our beautiful daughter , we miss you so much, give your brothers and nephew and all the others a huge hug from Dad and I, I can’t believe you are gone, but I know in my broken heart that you are no longer in pain, and your will watch over us all, you were a loving daughter, sister, wife and mother and loved so deeply that sometimes it blinded you, I will miss you more than words can describe I loved you with every fiber and being in my heart and soul, I’ll see you on the other side, you keep your brothers in line until I can get there, with all my heart and soul you will never be forgotten I love you Wendi, your Mommy and Daddy. Hugs coming to you with arms wide open. Love Mom. So beautifully written mom. She would love it. I’m going to miss you mama so much. Rest easy for me. I love you. So thankful for al who have commented. Wendi aka “WeeWee” was a beautiful soul, conflicted at times but always loved everyone who came into her life. She knew no strangers. She loved her family and she was loved by them all just as deeply. A sister is more than a family member who you grow up with, a sister is a best friend. I will always love and remember her. Her smile was one of the best in the world. RIP love you forever my friend..